Sandro Tonali, Vincenzo Grifo and Stefano Sensi have been called up to the Italy squad for the first time. 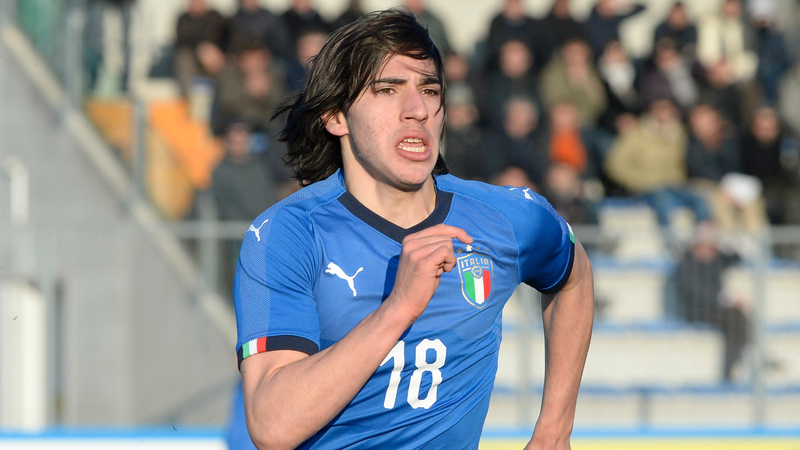 Brescia midfielder Tonali, who only turned 18 in May, has been included on the 27-man list after impressing in Serie B to the extent that he has been compared to Azzurri great Andrea Pirlo. Hoffenheim's Grifo and Sassuolo's Sensi have also been named in the squad ahead of next week's matches against Portugal and the United States. Nice striker Mario Balotelli and Torino's Andrea Belotti miss out, however, as does Juventus goalkeeper Mattia Perin, who has only made one club appearance this season. Roberto Mancini's side host Portugal at San Siro on November 17, looking for a win that will take them top of Group 3 of League A of the Nations League. They then take on the USA in Genk three days later. Roberto #Mancini has named 27 players in his squad for the upcoming #Portugal and #USA matches. Alessio Cragno (Cagliari), Gianluigi Donnarumma (AC Milan), Salvatore Sirigu (Torino); Cristiano Biraghi (Fiorentina), Leonardo Bonucci (Juventus), Giorgio Chiellini (Juventus), Mattia De Sciglio (Juventus), Emerson Palmieri (Chelsea), Alessandro Florenzi (Roma), Alessio Romagnoli (AC Milan), Daniele Rugani (Juventus); Nicolo Barella (Cagliari), Roberto Gagliardini (Inter), Jorginho (Chelsea), Lorenzo Pellegrini (Roma), Stefano Sensi (Sassuolo), Sandro Tonali (Brescia), Marco Verratti (Paris Saint-Germain); Domenico Berardi (Sassuolo), Federico Bernardeschi (Juventus), Federico Chiesa (Fiorentina), Vincenzo Grifo (Hoffenheim), Ciro Immobile (Lazio), Lorenzo Insigne (Napoli), Kevin Lasagna (Udinese), Leonardo Pavoletti (Cagliari), Matteo Politano (Inter).